That doesn't have to be true. In fact, with a little information (from this post ! ) and a little planning, you can spend less time cooking than you do now. Freezer cooking is known by a lot of different names. Batch cooking, once-a-month cooking, once-a-week cooking, make-ahead cooking ..... However you choose to refer to it, this process will definitely save you both time and money. One of the main reasons people are afraid to try this is because they don't believe they have enough storage room. 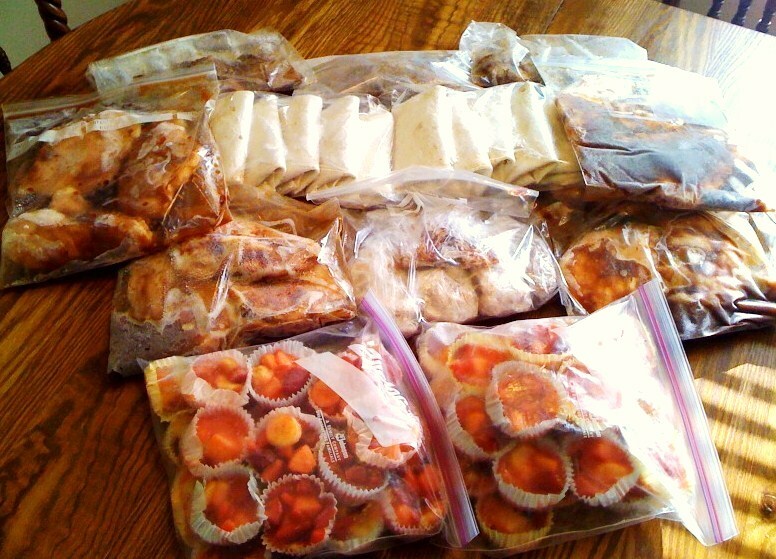 It isn't necessary to have an extra freezer to be able to cook ahead. 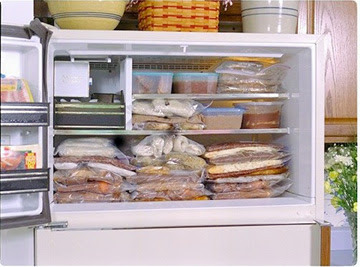 In the photo above, there are 30 family sized meals stored in a small freezer compartment, and there is still room for other basics such as bacon and frozen fruit. Another major concern many people have is packaging. Unfortunately it's all to common to find your food has freezer burn if it isn't properly packaged. With all the different options for packaging available this does not have to happen. 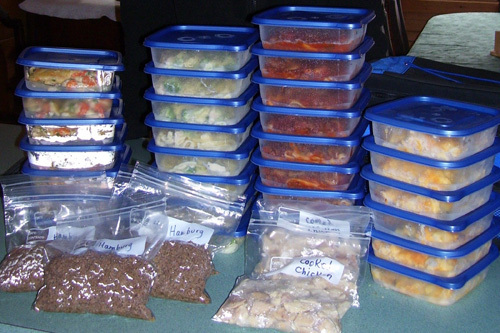 Here is a video that shows some basic options when it comes to packing your cooked ahead meals. This video show you how to get a good vaccum seal on your freezer bags even if you don't have one of those special vaccum sealers. And finally here is a video that shows you how you can get away without buying any freezer containers at all, just by using the same casserole dish to freeze that you will later use to cook the food. And you can do this and still have the same dish free to cook other meals. This is possibly a bit long-winded (It's two parts) but it shows even the most novice cook exactly how to do this. 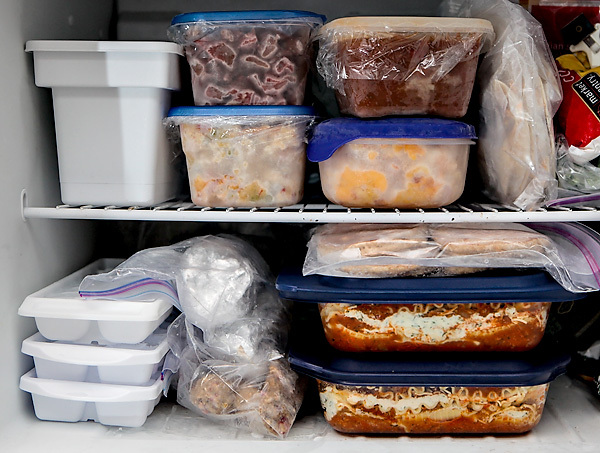 So, as you can see, with just a bit of knowledge freezer space and freezer containers are not issues to be concerned about. With saying that, having a collection of suitable containers is very helpful if you want to save time and effort. Here are a few that are very reasonably priced. They will pay for themselves with just a few uses. Many people now prefer to use glass, and even though these will cost you more initially, they are still worth collecting in the long run. You can get sets of different sizes and you don't have to stock up all at once. Buy a few containers each month, and before you know it you'll have all the containers you need. 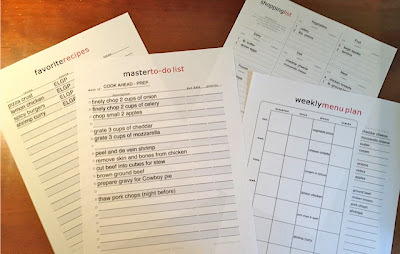 On the first sheet I list all the dishes I want to cook, what basic ingredients I need to check, and what extra groceries I need to either buy or take from my pantry. The second sheet is a list of prep. work. In professional kitchens the chef's don't do their own prep work. Unfortunately you do, but you also have the option of doing it before you start your cooking. Chopping all the onion you need at one time for instance will save you a lot of time, and you can store it in a bowl in the fridge until you're ready to cook. Once I have everything ready and my prep done, the actual cooking will be very easy. Especially since a lot of meals that I freeze will just be put together and then cooked on the day I plan to eat them. 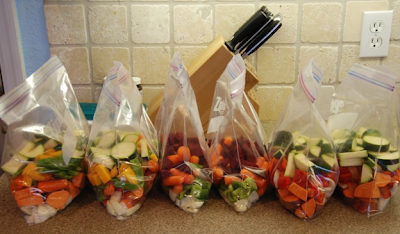 This makes the cooking day easier and your meals will taste a lot better. Here is how you too can create your own personalized cook ahead plan. I really like the new format of the blog and the added gardening section. The bread and microwave chocolate cake recipes are two of my go to favorites now. Looking forward to trying the recent Eggplant Parm recipe as well. Looks good, but please do some research on the damage to your health from the microwave. Microwaving food changes the molecular structure and greatly increases a person's risk of cancer and especially leukemia. I eat close to Paleo, but do no microwaving and no sugar.... I feel better than ever!